The Melbourne Cup. They call it the race that stops the nation and it is true. Even in primary school, the teacher would stop class half an hour before the race was due to jump. She would wheel out the rickety old teevee set and tune it in to the Melbourne Cup. Of course, gambling for 10 year olds is seven sorts of illegal in Australia and every other dark corner of the world, but somehow, we all had bets on horses that day each year. When the horses jumped and were pounding the turf at Flemington, we could all feel it in that classroom. During the race was the only time in the school year you could jump on your desk, smack your own arse and scream, “Go! GO! GO!” at the top of your lungs and not get in trouble for the privilege. The Melbourne Cup is the crown jewel of Melbourne’s Spring Racing Carnival. It is a thoroughbred horse race run over 3200 metres and held for three year olds and over. 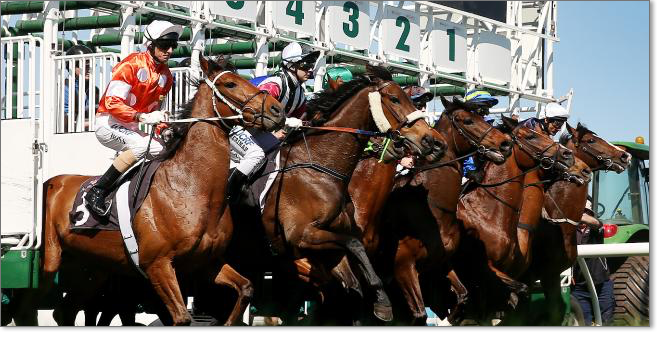 It is annually run at the Flemington racecourse at 3pm on the first Tuesday of November. With prize money in excess of $6.2 million, it is easy to understand how the Melbourne Cup is often referred to as the richest handicap in the world. The first place winner receives $3.6 million. In fact, the first ten placed runners receive some sort of monetary reward. It is difficult to tell what each online bookie will offer as bonus bets or promotions from year to year on the Melbourne Cup. But history has shown in the lead up to the Spring Racing Carnival bookies go berserk offering a range of promotions in an effort to try to entice their customers to bet with them over their competition. To get the full story on what any of our recommended online bookies are offering simply visit the promo page of your selected bookie to see what free bets, mega bets, inflated odds deals, cash back or bonus bets they have on offer involving the Melbourne Cup free bets or the Spring Racing Carnival in general. If years gone by are anything to go by you can look for cash back promotions on the Melbourne Cup – for instance, if your horse comes second or third you get the value of your first place bet returned in the form of a bonus bet up to a certain amount, say $100. Or you might find a deal on the Melbourne Cup that offers inflated odds in several horses. All this is on top of your sign up bonus. If you are a new customer to any of our recommended online bookies you may be eligible for their generous sign up bonuses, which can offer as much as $502 depending on which of our recommended online bookies you choose to open an account with. Are bonus bets legal in my state? Bonus bets, free bets and some promotions are not available to residents of Victoria, New South Wales, South Australia and Western Australia. This is due to each different state’s legislation concerning free bets, bonus bets and gambling promotion in relation to the advertisement and promotion of gambling in these states. Be aware to read the terms of conditions of any promotional deal to make sure you are truly eligible for any given deal. The following is a list of the last 10 years worth of winners, listed by horse name, jockey and trainer. We trust these recommended bookies because they have a solid reputation of providing the best odds, player safety and lucrative promos to keep their customers coming back. In Australia they say the Melbourne Cup is the race that stops a nation. In fact it is the crown jewel of Melbourne’s Spring Racing Carnival. The Melbourne Cup is steeped in history, first running in 1861 over 3,219 metres at the Victorian Turf Club at Flemington Racecourse in Melbourne. Since then the distance has been pared back to 3,200 metres. Since its inception the Melbourne Cup has been widely regarded as the most prestigious handicap race for thoroughbreds three years or older. The Spring Racing Carnival gets underway in October and runs through to November. The Melbourne Cup is the most highly regarded and well-known race held during the Spring Racing Carnival and falls on the first Tuesday of November at around 3pm, AEDT each year. Makybe Diva has won the most Melbourne Cup’s with a three-peat of wins between 2003 and 2005. The most Melbourne Cup wins by a jockey is four, held by Bobby Lewis and Harry White. Bart Cummings holds the most wins for a trainer with 12. When betting on the Spring Carnival and the Melbourne Cup in particular we prefer to use any of the following online bookies. Each one has a great reputation for player safety and protection as well as accepting deposits in a range of different currencies and accepting clients from a wide range of different countries. How do I bet on the Melbourne Cup from overseas? If you are in a country serviced by one of our recommended online bookies, betting on the Melbourne Cup is as easy as falling off a log. Simply log on to the site and create an account with your chosen online bookie and start to make your bets. If you can’t access the internet you can always try to phone in your Melbourne Cup bets with your favourite online bookie. Just look on your preferred online bookies’ information page to find the details of their phone betting policies. Is there any way I can bet on the Melbourne Cup if online bookmakers are illegal in my country? Most of our favoured online bookies have an international information number. Call them and tell them your situation to see if you can work together to come find a solution on how you can bet on the Melbourne Cup from where ever you are in the world. However if gambling and online betting is illegal in your country we cannot advocate or encourage you to break the laws of that country. If you have friends or family in Australia or a country that accepts online bets on the Melbourne Cup, ask them to place a wager for you.